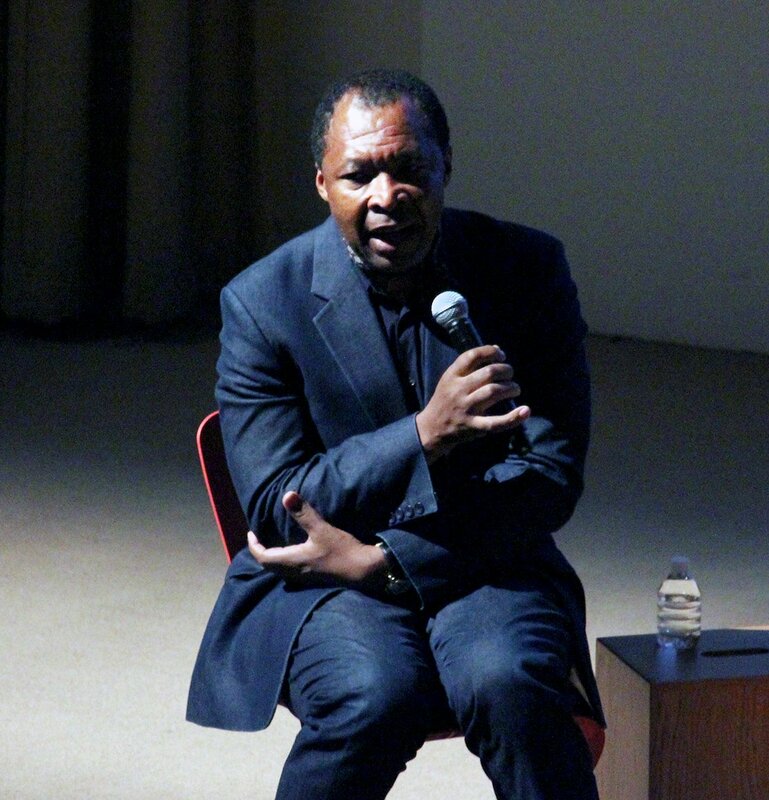 Over two decades Okwui Enwezor emerged as a dominant and highly influential voice in curatorial practice and contemporary art history. He was a curator and art historian who engaged and grappled with the various iterations of what might be broadly construed as the post-colonial and global turns in visual art. Born in Nigeria in 1963, Enwezor not only introduced many artists and works to calcified Western canons. He was also a trailblazer in roles that had historically been occupied by Europeans. Deeply cosmopolitan and global in outlook, he was an intellectual visionary. His brilliant conceptual rigour was realised in exhibitions that often felt larger than life. His curatorial style was often a mash up, combining unexpected encounters between art, documentary, popular culture and the archive; between different media, and between past and present. In much of his practice, Enwezor surfaced the art histories that underpinned contemporary art. He pushed from below, from what was past, into the present. It was always turned over, recognisable but different. I worked closely with Enwezor on three occasions. Each pointed to something of the character, impact and significance of the way he worked. The first was the 2nd Johannesburg Biennale in 1997. Enwezor was the artistic director and I was a lackey working on the publications and conference. Enwezor came to South Africa with the intellectual weight of having co-founded Nka: Journal of Contemporary Africa Art a few years earlier. He was fresh off what is often considered to be his breakthrough curatorial project, In/sight: African Photographers, 1940 to the Present in New York. Eschewing the long-held convention of organising biennales around national pavilions, he worked with a team of curators to create a series of conceptually-focused exhibitions under the rubric of Trade Routes: History and Geography. He brought an unrelentingly global sensibility that finally ripped the local art world from the insulating effects of apartheid and especially the cultural boycott. What he offered was something bigger than South Africa could handle. In what became a hallmark of Enwezor’s curatorial practice, the sky – and the exhibition’s opening date – seemed to be the only limits to what was possible. Overspending and budget shortfalls led to the early closure of the Biennale in early 1998. Suffice to say, Johannesburg has never offered an art biennale since. The second occasion was The Short Century: Independence and Liberation Movements in Africa, 1945-1994 in Munich, Germany. I was part of a team of co-curators under Enwezor’s lead. He ventured everywhere in his art historical and curatorial practice, from conceptually driven shows to exhibitions of single artists. But his return to grappling with African histories and geographies, as well as situating them in the world, is resonant in exhibitions such as The Short Century. Much has been made of Enwezor’s intellectual vision and rigour. More spitefully a great deal has been made of his personal ambition at the expense of the institutions where he worked. But little attention is given to how much the issues mattered to him. On the opening night of The Short Century, what I witnessed in his body language and tone of delivery glimpsed at the fuller extent of his emotional vulnerability, deep connection, and unrelenting conviction about what really mattered. This preoccupation with putting Africa front and centre extended to a number of standalone publications. These include Reading the Contemporary: African Art, from Theory to the Marketplace (1999, with Olu Oguibe); one of the books for his Documenta exhibition, titled Under Seige: Four African Cities (Freetown, Johannesburg, Kinsasha and Lagos); and Contemporary African Art Since 1980 (2009, with Chika Okeke-Agulu). I was always struck by how much Enwezor cherished his intellectual independence and freedom. Some of the mega exhibitions tied him to institutions for substantial periods. He is the only curator to be appointed artistic director of both the quinquennial Documenta and Venice Biennale. But there were not many instances in which he wedded himself to institutions. Two of the most prominent were a deanship at the San Francisco Art Institute (2005-2009), one of the oldest art schools in the US, and his directorship of Haus der Kunst (2011-2018), a modern and contemporary art museum in Munich. Both the institutions became platforms for radically advancing teaching, learning and collaboration, to realise a shared vision on an even larger scale. The third occasion I worked with him was with on Rise and Fall of Apartheid: Photography and the Bureaucracy of Everyday Life, 1948-1994. We co-curated the exhibition. It brought documentary photographs into a conversation with artworks, films, newsreel footage, books, magazines and other archival documents. As with so much of what Enwezor has done elsewhere, the exhibition was a moment to pause and reflect on the interconnection between a major historical event and the visuality that was in, between and around it. As with any exhibition that is ambitious, grand and sweeping, there are flaws and omissions. But what they do is that they create an inspirational and generative foundation for research that follows. That Rise and Fall of Apartheid has been the foundation for a great deal of further research into South African photographic theory and histories underscores the extent to which an exhibition’s legacy matters so much. What I will remember Okwui Enwezor for, more than anything else, is this hugely generative legacy of everything he has achieved.